Rumaki is a strange name for an appetizer with an equally strange list of ingredients. Making this strange sounding appetizer a real curiosity. I have wanted to try this funny sounding appetizer for some time now. 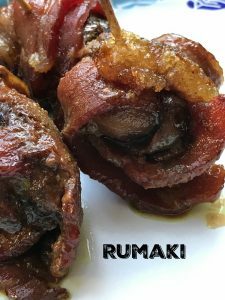 I decided to make Rumaki for an appetizer on Thanksgiving. Why? I knew my hubby would love these and most likely would end up eating them all….which he did! Like I said, I am not a fan of liver. I like liver páte, when it’s ice cold but that’s about it. 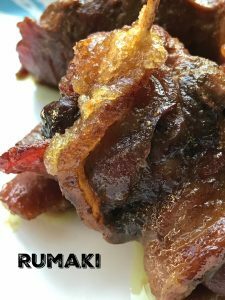 Now my hubby on the other hand loves liver, therefore he absolutely loved Rumaki. He even asked me when I was going to make them again, so rest assured liver lovers out there, you will definitely love Rumaki too. A strange sounding appetizer with a delicious taste. Cut each chicken liver in half if necessary; wrap a chicken liver around a water chestnut. 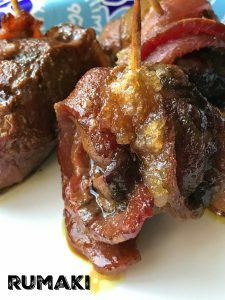 Wrap a slice of bacon around the chicken liver/water chestnut, secure with a toothpick. Sprinkle with salt and pepper. Combine soy sauce, melted butter, ginger and curry powder in a 3-quart glass baking dish. Add the chicken livers; turn to coat, sprinkle brown sugar over bacon/chicken livers, marinade overnight. 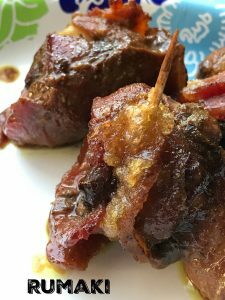 Remove from bacon/chicken livers from marinade and place on a baking sheet. Sprinkle again with salt and pepper. Bake at 350 degrees for 45 minutes or until bacon is crisp and livers are no longer pink inside.